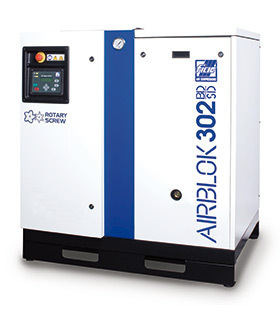 FIAC enclosed air compressors with oil injected quiet rotary screw features are available in 10-125Hp configuration and are easy to install, service and operate. 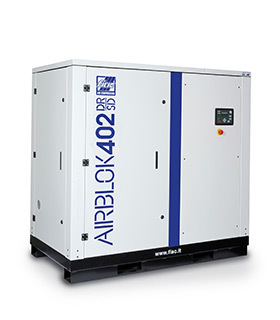 The AIRBLOK series of enclosed air compressors is very versatile offering belt drive, direct drive, and variable speed drive options. Offered in 3 outlet pressure settings of 115, 145 and 190 PSI and with available range from 10 - 60Hp. 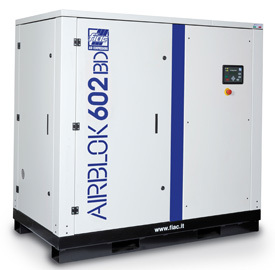 In combination with low maintenance cost the AIRBLOK BD-SD line of compressors is easily our most efficient unit to operate. Each unit uses a maintenance free coupler joining the TEFC high efficiency electric motor directly to the air end resulting in a maximum transmission efficiency. 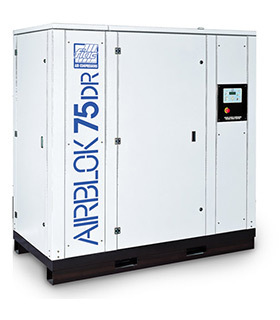 Provide the most energy efficient solution by maintaining an equilibrium between energy and air consumption.